Allie Rydell left her life behind to protect the world from the Goddess of Night. But after weeks of training, hunting, and learning to use the life-giving power that inexplicably chose her, saving Midgard seems more impossible than ever. Nott’s followers have eyes across the realms, and they’re determined to collect the bounty on Allie’s soul. And the closer Allie and her protectors get to the pieces of the immortal weapon that could save them all, the more destruction Nott manages to unleash—not only on the world Allie loves, but on the friends she’d give her life to save. Darkness is coming. And this time, it won’t leave any survivors. 5.0 out of 5 starsUnbelievable. Amazing. Surprising. Fascinating. Incredible --> Catch my drift. Gotta hand it to S.T Bende and Leia Stone. They really do know how to write a book that you have to read and keep reading until you know the end of the story...or in this case the end of the book which leaves you wanting more and more. This is the second book in the Night War Saga. I found this book we learnt more about no only the main characters but also the supporting characters (though I really don't want to refer to them as supporting because they are pivotal to the story. There is lots of action and adventure and moments that pull on the heart strings. Allie and Tore truly are an amazing pair. Well worth the read. If you have not read the first book, then please make sure you do. You won't regret it. I did receive an ARC of this book in exchange for my review... But I also purchased the book too on pre-order because I knew it was going to amazing AND I also wanted to support the authors to keep them writing the books I love. Man, I couldn't put it down! In love! Captivating story and adventure couldn't put it down, must read more! Prepare for binge reading!! This series is full of adventure and action!! We continue right off from book one and it was easy to get back in to. Allie is full of sarcasm and has the best personality that will have you laughing out loud. We go on another adventure with Allie and her protectors. Highly recommend to anyone who loves a good adventure. I could not put this book down!!! Can't wait for the next book in the series. 5.0 out of 5 starsAbsolutely brilliant addition to the series. 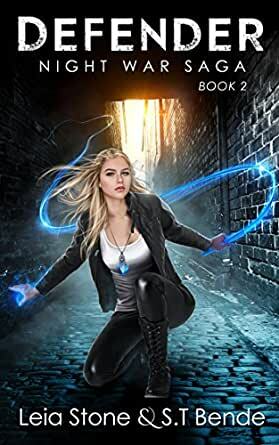 In the second installment to the series, Allie and her protectors continue preparations to protect Midgard from Nott. I laughed and I cried as I read this book full of adventure and emotions. One thing that I love about this series is the complex interactions, yet the book is appropriate for a YA audience. While there is a cliffhanger that guarantees that the reader will want the next book NOW, many previous questions have been answered. Many more questions have also arisen. I cannot praise this book enough. Absolutely brilliant addition to the series. The emotions in this book are so much more intense than they were in Protector. Allie goes through so many life altering things in this book it is a wonder she is still standing. She isn't the only one affected by the changes, surprises, and the pain introduced in this book. Her new family is suffering too. Tore, Mack, Johann, Bodie, and Greta are just as affected by the events in this book as she is. I love this story. The love, passion, fear, pain, excitement, adventure, and compassion this book has in it is astounding. I can not wait for the next book so that I am able to find out what happens with and or too the characters. 5.0 out of 5 starsBE A HAPPY NORSE LOVER!! You need this book in your life. I promise you will not be disappointed. Pushing the “read now, or buy now” will make you a happy Norse lover. These authors never cease to amaze! S.t. Bende and Leia Stone weave another amazing story, sucking you away from reality with each turn of the page. Individually as writers I didn’t think they could get better. It’s now in the “CLOUD” I was wrong! They surpass my expectations with each new book. All of the characters while strong, show moments of extreme weakness binding the “team” to Allie and Allie to the “team”. Allie’s continued search for her weapons pieces which are strewn across the realms will leave you hanging off the end of your chair. The characters in the story are growing individually all the while fusing as a team. Kind of like Allie’s weapon which she is trying to find the pieces and rebuild. Allie even gets a taste of the true evil known as the goddess of Night (I call her bag ‘o’ bones!) in this book. The electric jolt these authors throw at us in the last chapters make you want to cry/scream/wail for the next book. What will happen with Allie’s team and even to Allie? I can’t wait to see the next book unfold and amaze me even more. Two thumbs up guys, YOU ROCK!! This is the second book in the series and it was awesome. You learn more about Nott and her powers and get to see her close up. Allie and Tore are getting better working as a team. This book is full of action from the beginning to the end. There are still parts that make you laugh which helps to lighten things up. There were some very surprising things that happened and I will not give them away, no spoilers from me. The ending leaves you really wanting the next book to hurry up and get published. I cannot wait to see how all of the little mysteries get solved. It did make me go back and re-read parts of Protector especially the beginning when Allie meets Tore.